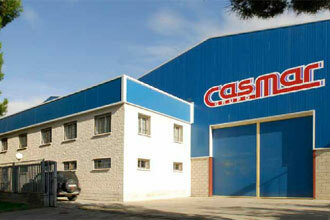 El CASMAR GROUP, HEADQUATERS, is situated in PAÚLES industrial place in Monzón (Huesca) parcels 40, 41 y 42 where you can find Castillón Martínez S.L. and MECIME S.L. workshop and in parcel nº 70 of the same industrial place is Talleres SOPENA S.A. workshop. In 1988, two men, Ramón Castillón Buil and Adrián Martínez Oncins both with great experience in the Steel construction industry decided to become business partners and founded Castillón Martínez S.L. the beginning was very hard, with few facilities and room which barely could cover the needs of the small group of people who began there. In spite of this, their determination and their keen interest of going on helped to sort out difficulties.After some years of struggle and hardworking they were able to move to Paúles Industrial place in 1985. A modern and very close to the city, industrial place where was built a modern workshop that it has been upgraded and expanded for the latest 15 years. Now, we have the required infrastructure to place modern tools and machinery suitable for assembly and Welding works. New technologies applied to engineering and office Works have given to the technical and management office a high work capacity. Including (1 CEO y 1 CTO), management (1 accountant y 2 administrative staff). The technical office of CASMAR comprises 3 Industrial engineer degrees and 1 industrial technical engineer, 3 designers all of them are looking for the better solutions to all the inquiries our customers could have. They can make projects by their own or adapt them to new situations. Our engineers have a lot of experience developing solutions to industrial companies in many areas… chemical, refineries, water treatment etc. 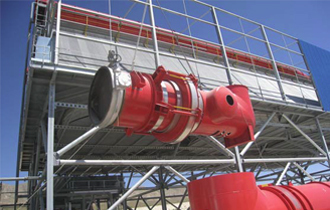 CASMAR GROUP has 3 workshop heads and 2 heads of Works in site to carry out assembly and maintenance tasks. There are a lot off highly qualified first class officers, who work into the indoor 7.000 m² of the 14.800 m² which occupy our facilities. Inside we will find machinery and tools with the most modern technologies so we are able to develop our work with the required solvency. Later we will enumerate some of them highlighting their most important features.